Heat oil in skillet til hot over med-high heat, but not smoking. In a large bowl, Combine the rest of the ingredients to make dough. 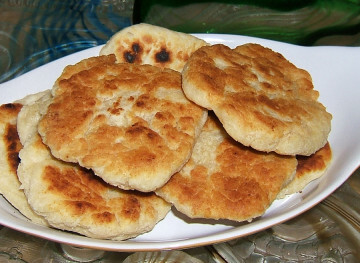 Fry shaped dough in hot oil til brown and crispy. Traditionally you would eat this with stew. Or top with some honey. I personally like to spread a little butter on it. Two other popular choices, make chili. Pile Chili on top and add a little cheese, lettuce and tomato for a"Navajo Taco" Or use the round as your base for a Tostada, add taco meat, beans, cheese, lettuce, tomato and Guacamole. ''This is a type of chicken curry in a thick gravy with a nice spicy flavor, but is not too hot. You may adjust the 'heat' by adding more serrano peppers. Serve over rice, or with chapatti or roti." 1.Heat the oil and ghee in a large pot over medium heat. Cook the cumin seeds in the oil until the seeds begin to change color. 2.Stir in chopped onion onion; cook and stir until onion has softened and turned translucent, about 5 minutes. Add the garlic and ginger; continue cooking until the onions brown, about 5 minutes more. 3.Mix in the chopped tomato, tomato paste, garam masala, turmeric, salt, serrano pepper, and water; simmer 5 minutes. Lay the chicken into the sauce; mix gently to coat the legs. Cover pan and reduce heat to medium-low. Cook until chicken is no longer pink near the bone, about 40 minutes. Garnish with cilantro to serve. In a large skillet, heat the olive oil over medium-high heat and saute the onion until fragrant and translucent. Add the Italian sausage meat, breaking it up with the back of a wooden spoon and brown it until no longer pink, about 10 to 12 minutes. Drain the excess fat from the sausage meat, and set aside to cool. In a large mixing bowl stir together the drained and squeeze-dried spinach, ricotta, 1 1/2 cups Parmesan, eggs, cooled Italian sausage and onion mixture, salt, and freshly ground black pepper, to taste. Place the oven rack in the center of the oven and preheat the oven to 400 degrees F.
In a large pot of salted boiling water, cook the fresh pasta rectangles for 1 minute and remove with a slotted spatula. Set aside. In a 9 by 13-inch baking dish, spread 2 cups tomato sauce. Working with 1 pasta rectangle at a time, spread 6 tablespoons filling along one edge and roll the pasta sheet up tightly, leaving the ends open. 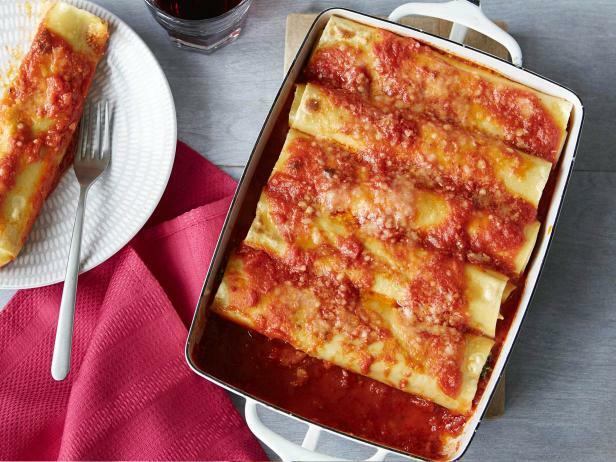 Repeat until you have 8 cannelloni. Arrange the prepared cannelloni, seam-side down, in a single layer in the baking dish. Spoon the remaining 2 cups tomato sauce evenly over the cannelloni. Sprinkle the remaining 1/2 cup grated Parmesan over top. Bake the cannelloni for 20 minutes and let it stand for 10 minutes before serving. Serve the cannelloni with extra tomato sauce from the baking dish and garnish with fresh basil. Mound the flour on a clean work surface. Hollow out the center making a well in the middle of the flour with steep sides. Break the eggs into the well. Add the salt, and olive oil to the hollow center and gently mix together with a fork. Gradually start incorporating the flour by pulling in the flour from the sides of the well. As you incorporate more of the flour, the dough will start to take shape. With your hands or a bench scraper continue working the dough until it comes together. If the dough is too dry, add a little water; if too wet or sticky, add a little flour. Begin kneading the dough and keep kneading until it becomes smooth and elastic, about 8 to 10 minutes. At this point, set the dough aside, cover it with plastic, and let it rest for 15 to 20 minutes. You can store the dough in the refrigerator for up to 24 hours, but allow it to return to room temperature before rolling it out. Divide the pasta dough into 4 even sections. Keep each section covered with plastic wrap or a clean towel while you work with each one. Flour the dough, the rollers of a pasta roller (or your rolling pin), your hands, and the work surface. If using a pasta machine: Flatten 1 of the of the dough pieces between your hands or with a floured rolling pin until it forms a thick oval disk. Dust the disk, the roller, and your hands with additional flour. Flour a baking sheet to hold the rolled out finished pasta. With the roller on the widest setting, pass the pasta through the machine's rollers a few times until it is smooth. Fold the dough over into 1/3, and continue to pass through a few more times until the pasta is smooth again. Begin adjusting the pasta machine settings to become thinner, passing the dough through a few times at each setting. If rolling the pasta by hand: Flatten a dough piece into a thick oval disk with your hands. Flour a baking sheet for the rolled out finished pasta. Place the oval dough disk on a floured work surface, and sprinkle with additional flour. Begin rolling out the dough with a floured rolling pin working from the center of the dough outwards, constantly moving the dough and lifting it to make sure it's not sticking. In a large saucepan, heat the olive oil over medium heat. Add the onion, and garlic and cook until soft and golden brown. Add the basil and cook for an additional 3 to 5 minutes. Add the canned tomatoes with their juices and bring to a boil, stirring often. Lower the heat and simmer for 15 to 20 minutes, until the sauce has thickened. With a potato masher, break up the tomatoes to achieve a sauce-like consistency. Season with salt and freshly ground black pepper and serve. Cook's Note: Tomato sauce will last 1 week in the refrigerator and up to 6 months in the freezer. © Marn Recipes © 2017 Glenda Networks, LLC.All rights reserved . . . .